Fast conversion rate comparing to other drm removal. SoundTaxi is a program to convert your DRM and non-DRM audio files and rip and burn CDs. As the program states, it should only be used on DRM-protected media that you actually own. If you do, then it can be liberated from the original format so you can use it on various players. The SoundTaxi Pro+Video Rip interface is plain but easy to use. You add media with Select Files, and can then convert it, copy to iPod, burn to disc or play it within the SoundTaxi Pro+Video Rip interface. 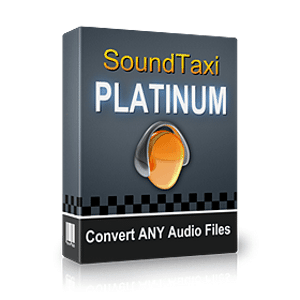 SoundTaxi is easy to install and use which easily convert your DRM protected and any non-protected music and movie files to MP3, M4A (iPod), WMA or WAV (audio) and MP4, AVI (DivX) or WMV (video) at high speed and CD quality – legally. Do you need just a simple converter for your music (including DRM protected files)? Then choose SoundTaxi Platinum. It costs little, but does its job well. You can easily and fast (2 simultaneous conversions and 6x conversion speed) convert your audio files to one of the commonly used formats (MP3, M4A, WMA or WAV). .
Music from all major online music services including iTunes, Napster, Yahoo Music, Zune, MSNMusic, MusicLoad, Rhapsody, MTV Urge, MusicNow, BuyMusic, AOL Music and Sony Connect may as well be converted by SoundTaxi. SoundTaxi, too, can do file conversion from any of the formats (WMA, .M4P, .MP4, .AAC, .MP3, .WAV, .OGG, .SND, .AIF) supported and recognized by various music players thus able to play it. In addition, it has the ability to preserve ID3 tags for artist, album, title names and the like. With the help of SoundTaxi, you will never have to worry about digital rights. SoundTaxi is program and performed solidly throughout our testing and coped with everything that was thrown at it. SoundTaxi requires your system to run on a Windows 8/7/Vista/XP (x32 or X64) and have Microsoft’s MediaPlayer installed in your computer, one of the bad things in it only has 3 output formats, MP3, WAV and AAC, severely limiting your options, but if these format is what you are looking for so this program is right for you .